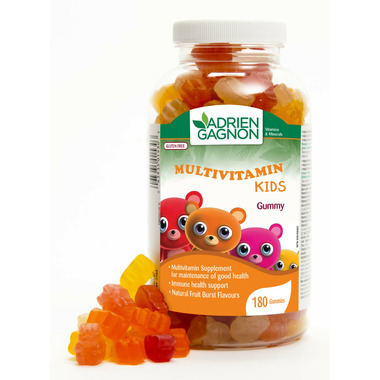 Adrien Gagnon Multivitamin for Kids helps the body to metabolize carbohydrates, fats and proteins. It helps to form red blood cells and helps in the development and maintenance of bones and teeth. Kids are often fussy about food. It can be difficult to have them eat all the nutrients they need. A multivitamin that is fun to take can be a great ally. Children 1 to 3 years: Take 1 gummy daily. Children and teenagers 4 to 17 years: Take 2 gummies daily. Take with food, a few hours before or after taking other medications. Great value, very decent ingredients. Like so many others have said, these are our go to vitamins. One of the best, natural flavours, colours. I only have to buy one brand of vitamin for both our 9 & 13 year old. Always buy the 180 count bottle, great value! My go to! Happy kids! My kids love these over other gummy brands. Purchased several times. Kids love the taste and will take their vitamins without hesitation. Not overly sweet like other brands and the price is always right! amazing product for children and adults also. Can't beat the price! My son loves this easy to chew. Flavors are great! Gets his daily vitamins . I am really impressed I will definitely purchase again after the bottle is finished. My kids love these vitamins! I was a bit annoyed that I could not find the non-medicinal ingredients online. I took a chance and the ingredients aren't terrible but could be a bit better. Great price though! My kids, Love the taste. Which is huge for picky eaters. I feel assured, that I am helping them get the vitamins they need daily. My three year old loves these vitamins... and so does my husband. These taste amazing. My kids love them! Good flavor, easy to chew and the kids like to take them. Win! Kids love this, no hassles to take their vitamins! Great price and size as well. My daughter loves the taste of these and is excited to take one every day. Minimally sick, these vitamins have proven to work quite well! A staple here. My 2.5 year old asks for more than one a day. I cut them in half as they are pretty chewy for a little mouth. Wish they weren't so sweet, but after reviewing several brands these seem to be the best for the price. They're not as soft as some other gummy vitamins but the flavour is great. Not too sweet and sugary. They are a favourite in our household. My kids are obsessed with these. Nice and soft, great taste and less artificial than many of the alternatives. My kids love this and giving them this every morning is their happy moment! My daughter loves these vitamins, never a battle to get her to take her multivitamin everyday. The taste is pretty good too. These are our go-to! Best gummy I've found for the price and ingredients. Plus they're soft and have a great flavour. My kids love them and my husband loves sneaking them too! We love these gummies! Great taste, no junk, good price. Great tasting vitamins and they are easy on the stomach. I got them for the kids but my husband has decided if he's taking a vitamin every day, it's going to be a gummy bear since regular multivits give him gut rot. Also the price is right. Good price and my kids want to eat the gummies all the time! My 3 year old enjoys these vitamins and the price is right. I have tried many different brands of multivitamins for my 4 little ones. The Adrien Gagnon gummies are by far the best! They love the taste of them! The price is pretty nice too! Well ca has the best service! My son loves these!! I buy them regularly because he has no problem taking these. My son had the ironkids gummies before these and they were tough and difficult to chew. These vitamins are soft to chew and delicious. I highly recommend them. Very yummy. Kids love them. Best value for kids vitamins I have found. WOW! my kids love these ones! Tasty! Great taste, great price and my kids loves it! My picky eater loves it, so I like it too. The price is also good! We normally have another brand, but couldn't get them, so we tried Adrien Gagnon. My kids went nuts over them. These are way better they all cheered. I tried them too. They really are a soft chewy and very tasty. All my kids love these! They are very soft and tasty! My husband eats them. All of my kids love these! 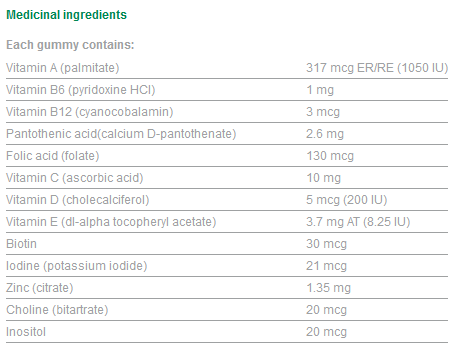 my picky eater eats this multivitamin everyday, he doesn't mind the taste at all. I am glad I found something he likes.